First-time users: You must create a new username and password for this site. This is separate from your CAP login. 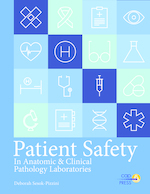 Patient Safety in Anatomic & Clinical Pathology Laboratories describes patient safety culture in the laboratory and how it fits in with the larger mission and purposes of the health care enterprise. The text addresses common types of errors seen in pathology and the role of cognitive bias in contributing to these errors, reducing errors through communication and technology, and tools and methods to improve patient safety. Also addressed are building high-reliability teams and the role of the patient navigator in addressing patient safety issues through continuity, coordination, and care. The book also describes developing and implementing a patient safety curriculum in order to fulfill ACGME training requirements to meet standards for resident and fellow education for anatomic pathology and laboratory medicine.